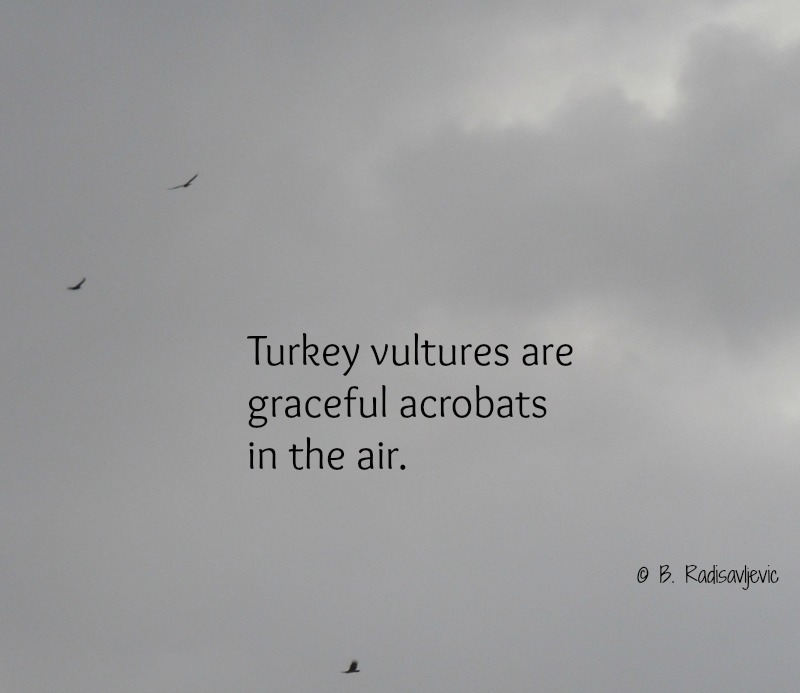 The first Saturday in September is International Turkey Vulture Awareness Day. Many people don't appreciate vultures because of their looks and their reputation as scavengers. The turkey vulture is even nicknamed a buzzard -- that bird we often see circling over deer or other dead animals killed by cars on our roads. It has a bald red head and beady eyes that zero in on any dead creature on the ground. I don't normally consider turkey vultures beautiful. They are actually a bit ugly when compared to some of the other birds of prey. In the air, though, it's a different story. I love watching them fly in groups as they are above. I very often see two or more circling together. Although they are hunting for food, they also fly over buildings and go over and under the power lines. The photos above were taken on a February rainy day between showers. Some people appreciate the turkey vulture enough to use a bumper sticker to tell the world that they love them. Why not? They help keep our natural areas and roads and fields clean. Do you want a lovable little vulture to cuddle? It's there for you. If you merely want to help your children learn more about turkey vultures with great photos, easy-to-read text, and even some projects, try the books below. Some people have to go to zoos to see turkey vultures. 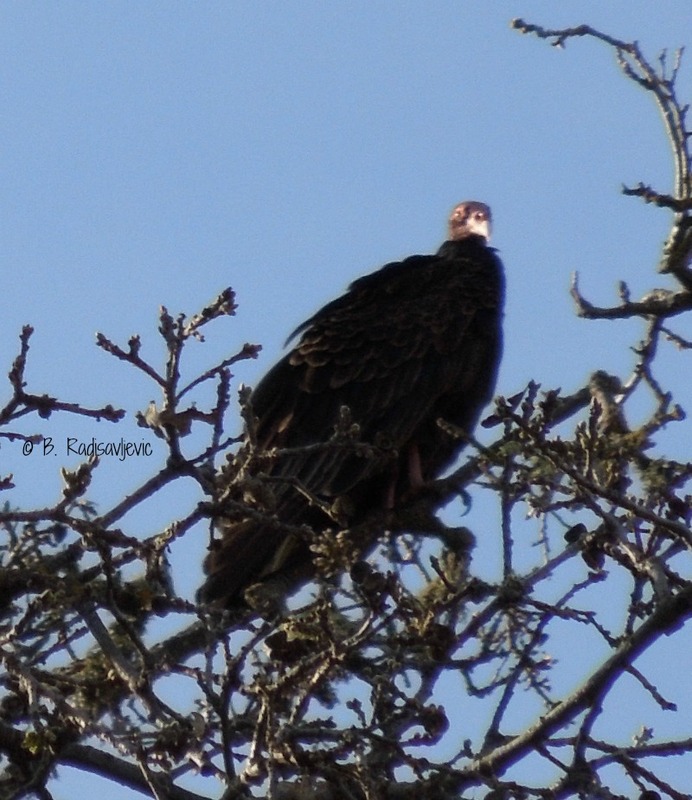 Here in Paso Robles and Templeton, all you have to do is go for a walk on a country road or visit a vineyard or open field and you are likely to see the turkey vultures overhead. Take a few minutes and just watch them. Any day can be Turkey Vulture Day. 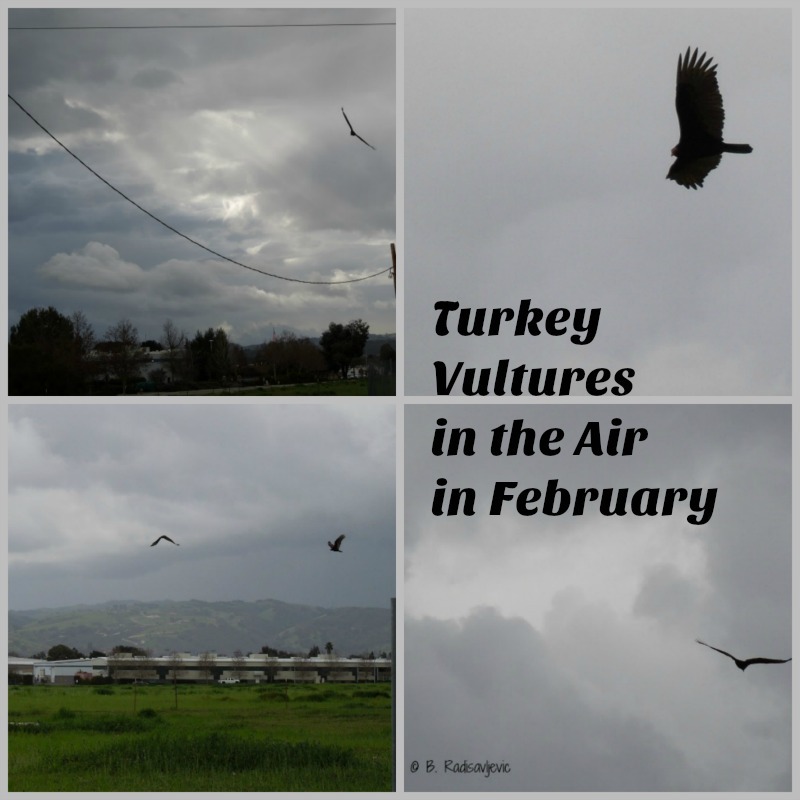 Do you see turkey vultures where you live? How do you feel about them? The September theme for City Daily Photo Bloggers is Library, so I decided to take you on a photo tour of our city library. 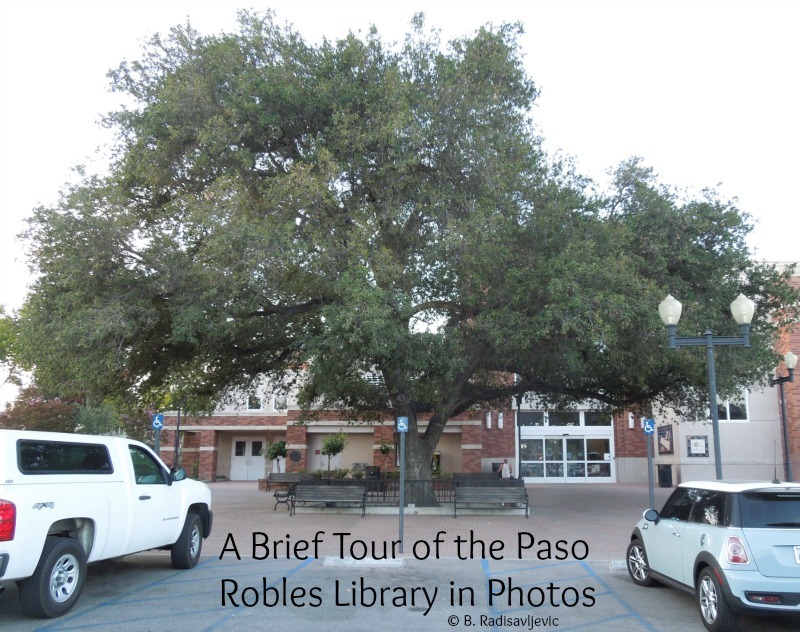 To get to the Paso Robles Library entrance, one must pass under this massive oak tree. ( Unless one uses the street entrance on the other side of the building.) Most library visitors park in the lot, though, and enter by the oak tree entrance. 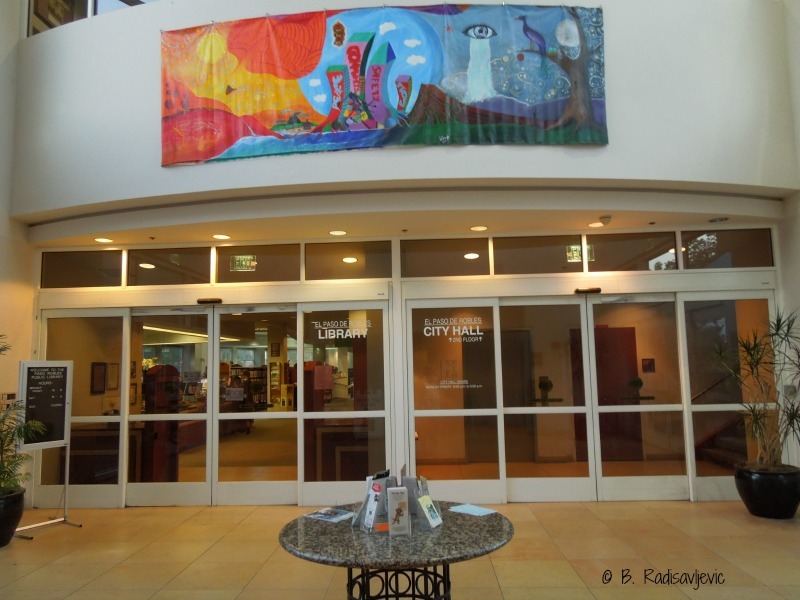 Once through the doors, you find yourself in in a foyer that leads into the library, the city hall, the restrooms, the conference rooms, and one of the library bookstores. You can also see across to the other entrance. It looks out to the park where you can walk across to Farmers Market on Saturdays mornings and Tuesday afternoons. Most people don't use that as a library entrance because parking is harder to find there. 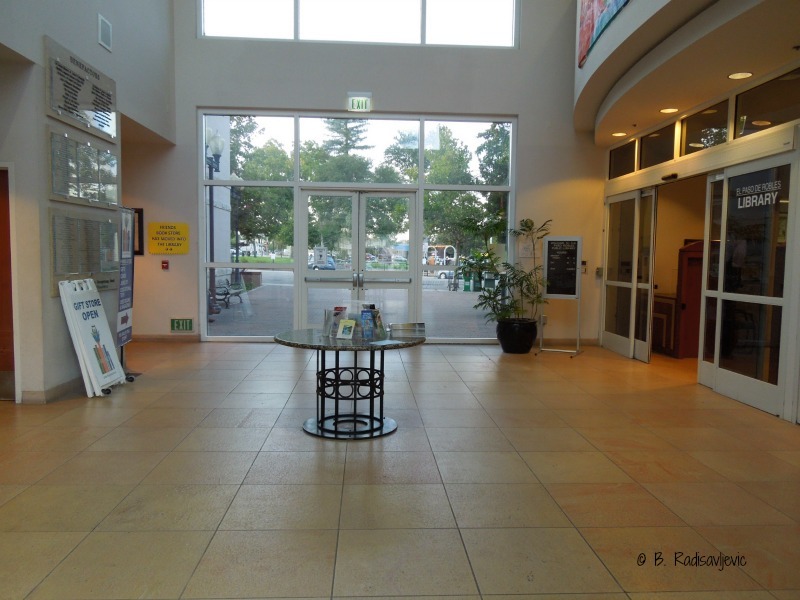 Behind these glass doors are the library and the staircase leading to City Hall. The table is used for sharing literature pertaining to city events. 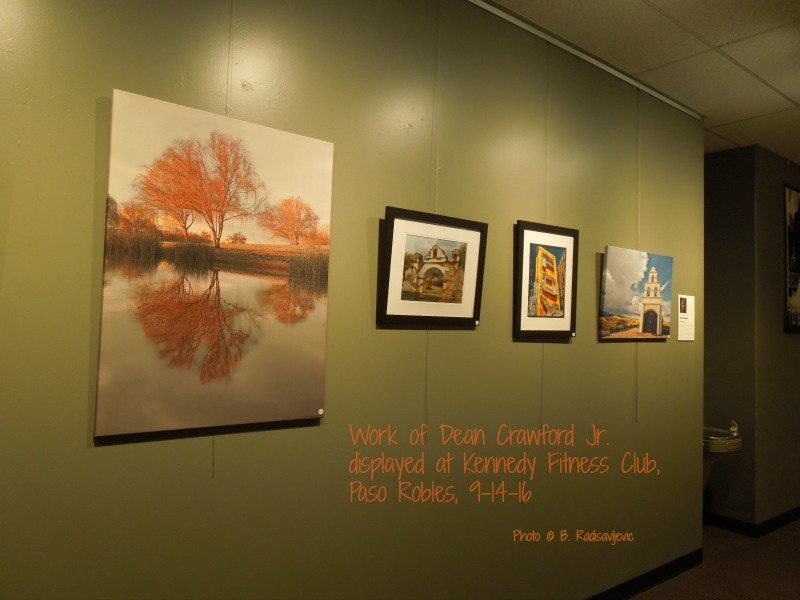 As you enter the Paso Robles Library and walk past the service desk, the first thing you really notice ahead is the display wall of the children's area of the library. Here is an overview. 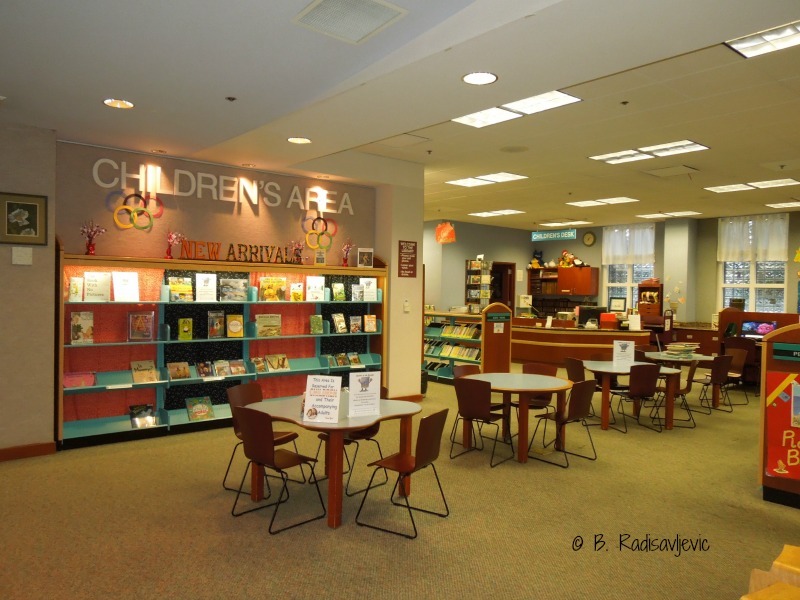 The row of reading tables runs through the center of the children's area. Here's another view. The children's periodicals are on display here. To the right of the display shelf is the picture book area. We will get a better view of it in the next photo. You can see the Highlights magazine we used to read when even I was a child is still around. The aquarium below acts as a wall divider between the hallway and the children's area. 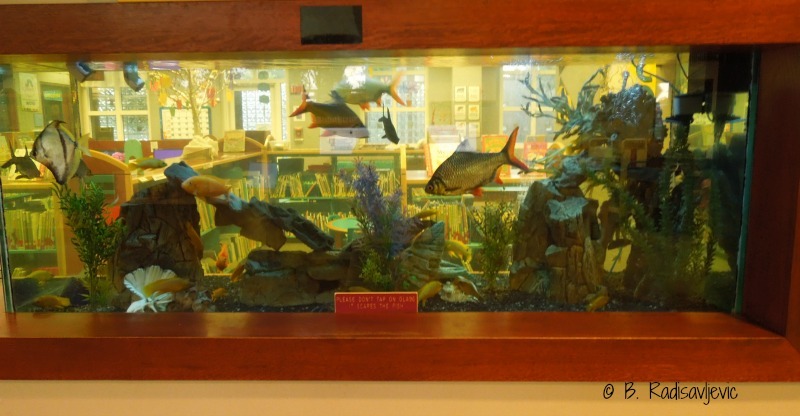 You can look through the water to see inside the picture book area. 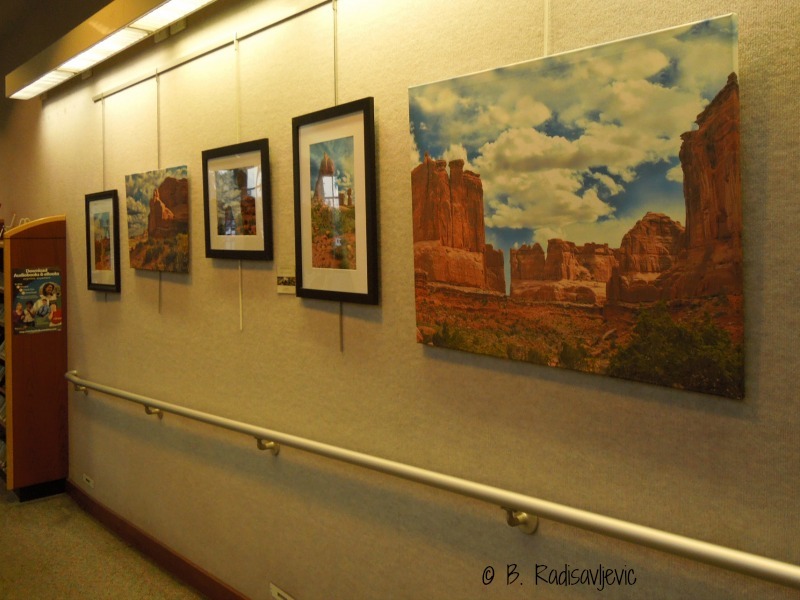 The library gives a wall for the display of local art. The exhibits change frequently. If you continue down this hallway, you will find CD's and DVD's to borrow. You can see one of the cases at the left corner of the photo. A library would be nothing without real books. The Paso Robles has lots of them, though they now also let you check out digital books for your reading devices. I haven't tried it yet. The picture below shows the heart of the adult section. 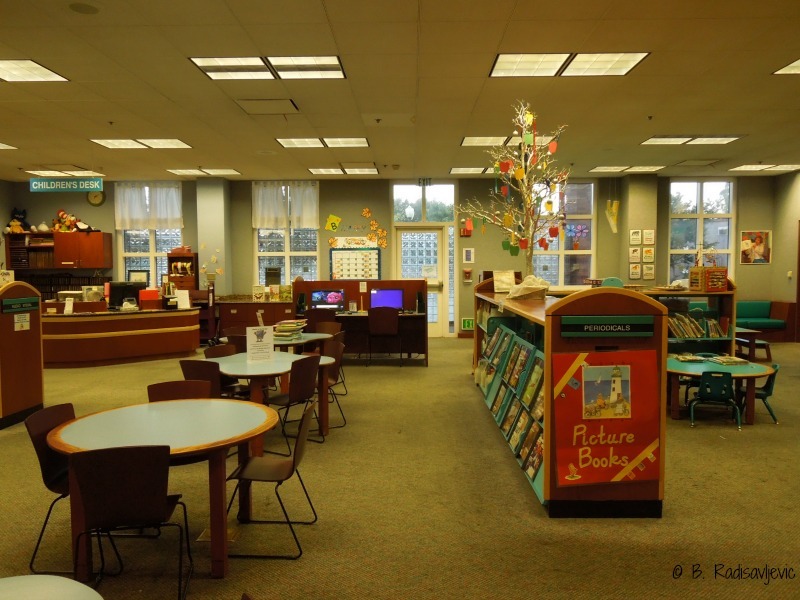 First you see the reference desk in the center where you can ask questions and get directions to what you need. Beyond the reference desk are the stacks. On the left side you will find fiction. On the right you will see the first cases of the nonfiction stacks. You can also see the computers near the middle. Along the wall by the window are study tables and some cubicles. The windows look out on City Park across the street. This next photo focuses on that area by the window a bit more. In the photo above you can also see the row of upholstered chairs where people often sit to read periodicals or books. The homeless often catch a nap here. I often sit here and read on Smart Days when I want to stay cool outside the house. The label on the prominent case in the photo above reads Graphics. When I was a child, the books in this section did not exist. The closest thing we had to today's graphic novels were comic books. Libraries did not have comic books. This form of literature has become important in the past few years. 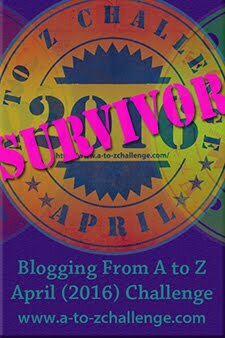 It became a book category in bookstores in 2001. Although these are called graphic novels, they are not all fiction. Many nonfiction graphic novels can be found in classrooms today. I used to sell them when I was selling educational books. They appealed to young people whose reading skills could not handle normal books at their grade level. The first graphic novels I carried were the classic collections of Tin Tin books by Herge. Both my husband and son loved them. They were some of the few graphic novels you might find in a library in the 1980's. If your library doesn't have them, you can find them at Amazon. 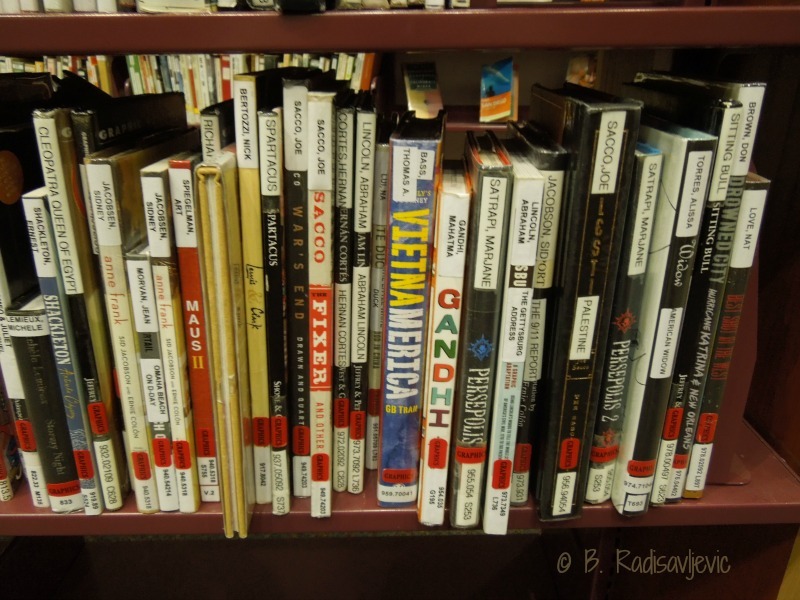 Here are some of the nonfiction graphic novels you can find at the Paso Robles Library. The Library Helps Bring the Community Together. 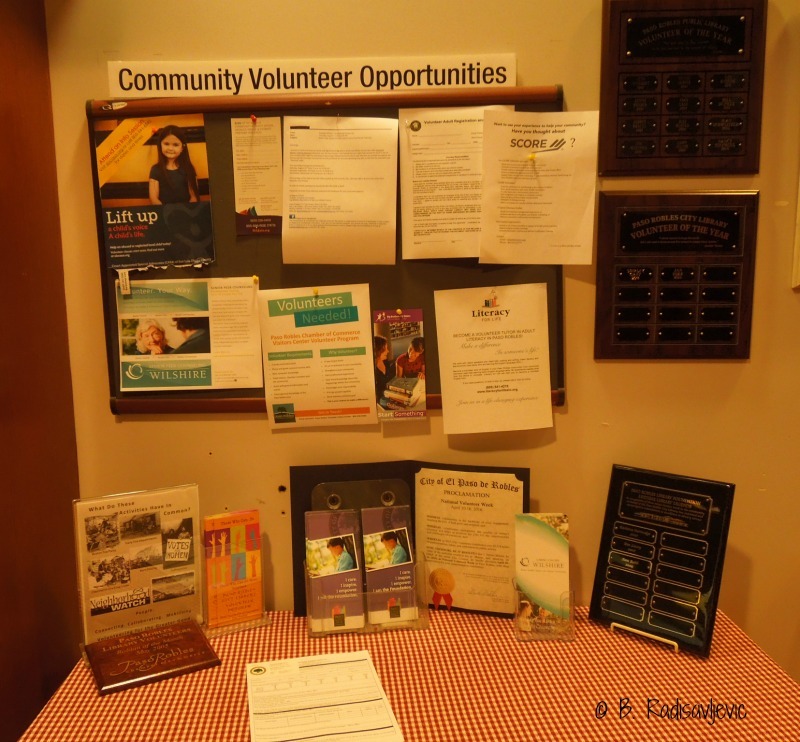 As you come through the library doors, the first thing you see on your right is this table and bulletin board. They explain volunteer opportunities in Paso Robles. Just past it are two other information displays -- one announcing community events, and another with hand-outs about community resources. You will often see volunteer tutors with their students in the library, but I'm not supposed to take pictures of them. I didn't see any today anyway, but I often do see them. People who don't have computers use those in the library. 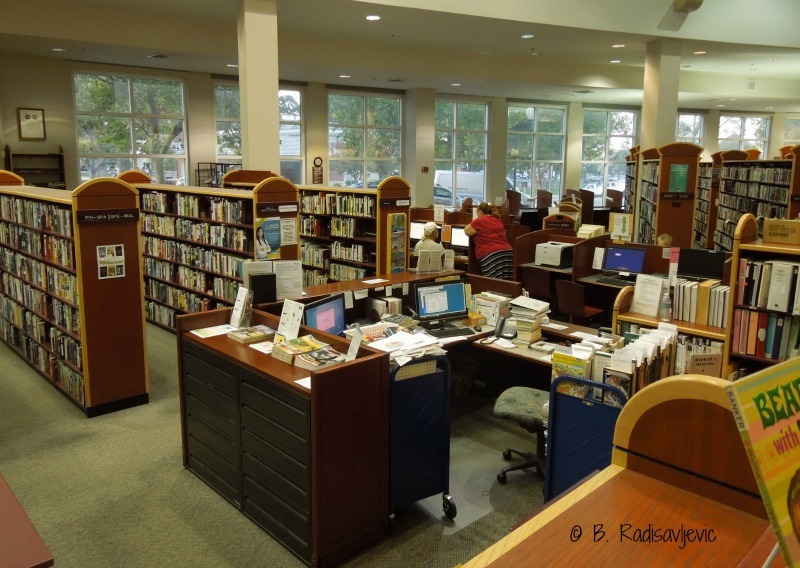 Those who want to find cheap books to keep can find them in the library bookstores run by the Friends of the Library. The City Council and other groups hold meetings in the library conference room. 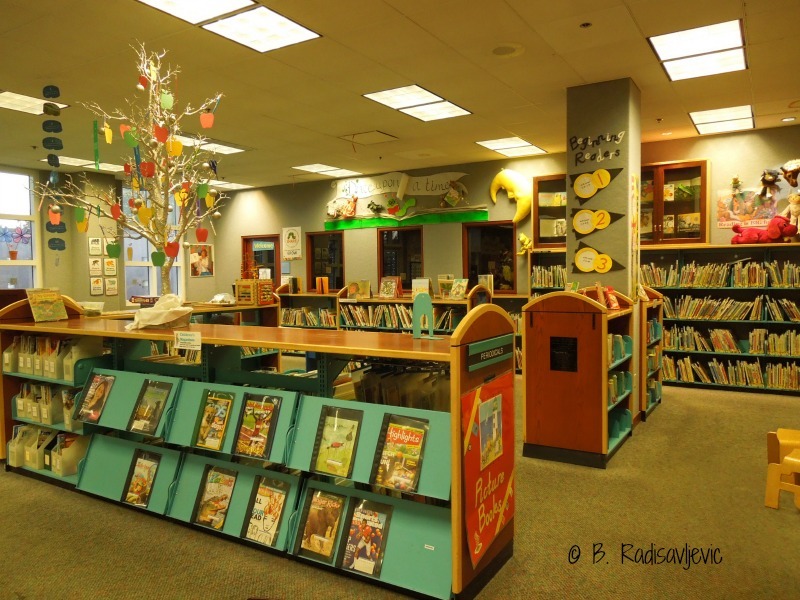 The library also has special programs for children to keep them interested in reading. These are often seasonal. 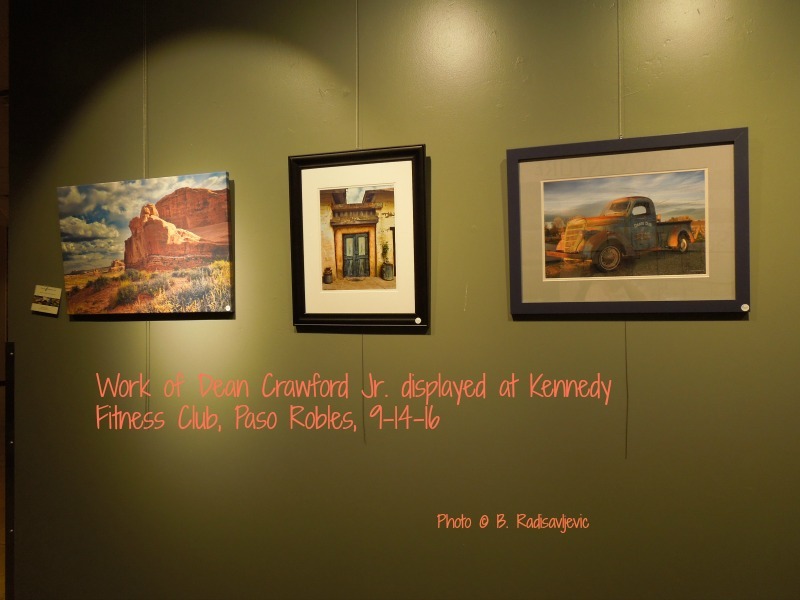 The Paso Robles Library is a vital service that helps every segment of our community. How does your city's library compare? 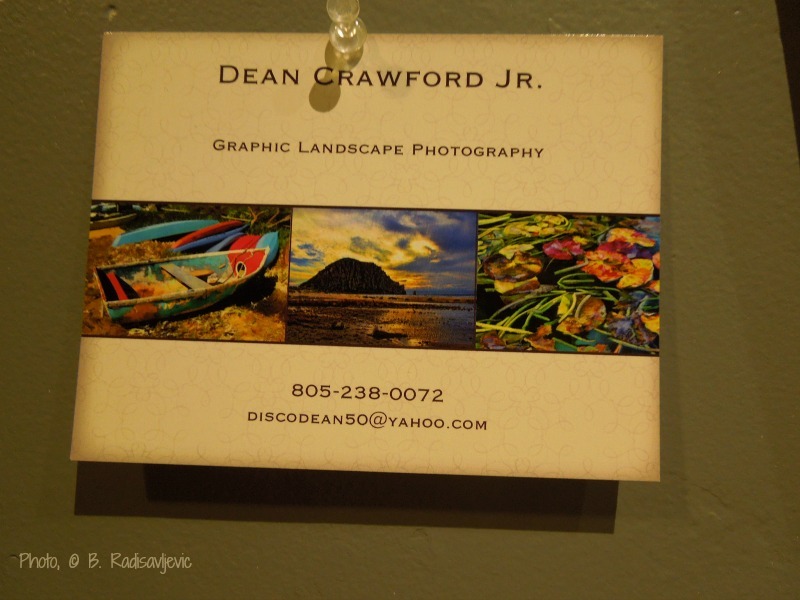 Does it offer much the same kinds of services? Does it have services we may not have? 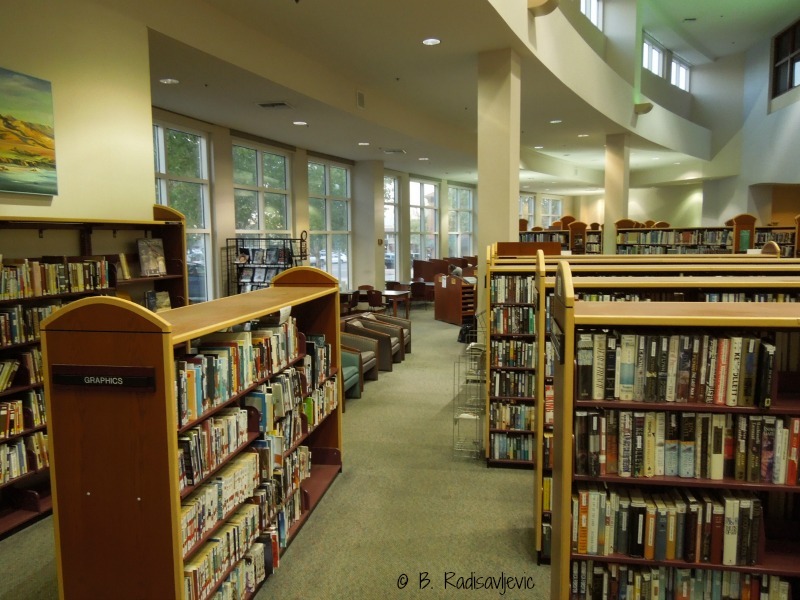 What do you like best about your library? 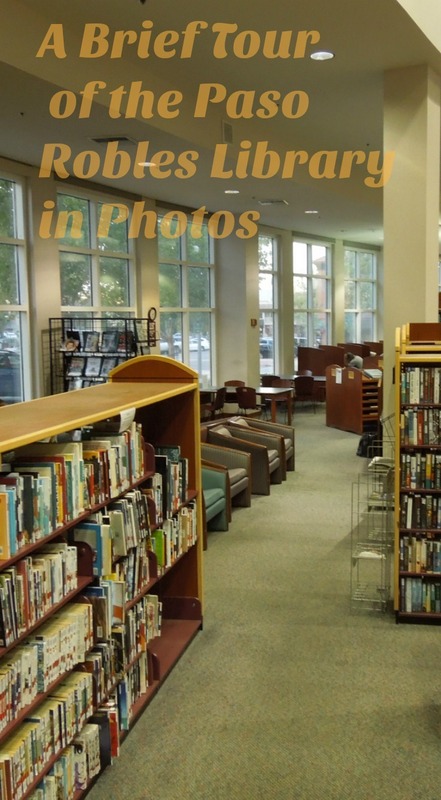 If you'd like to see what other City Daily Photo bloggers around the world have shared about their libraries, check out the theme photo gallery. To see my other posts about our library, click one of the icons below. You will see details that I haven't included here.